Editorials from Theslowlane: Is Evolution Intelligent Design? Also, is intelligent design evolving? A rainbow can be described in different ways. It's a colorful rainbow, but it's also just light refracting through water droplets. This analogy can apply to our bodies as well. Are we just complex electrochemical reactions, or intelligent human beings with consciousness and feelings? Take this analogy farther and think about processes that developed the great variety of life on this planet. Is it just stuff like interacting molecules, random chance and natural selection or is it intelligent? The rainbow is both "rainbow" and "water droplets." We are both "biochemical reactions" and "human beings." The natural processes that lead to our existence are both "mechanical," in some ways, and "intelligent" in other ways. A related question might be. "What is intelligence?" Some folks might wonder if those of us who ponder these questions are truly intelligent. Of course, being intelligent is not necessarily the same thing as being pragmatic. Some people say that the Earth, itself, is intelligent. The Earth could even be conscious. Why not? It's a complex system, like our bodies. Can an ecosystem, or a forest, be conscious? How about a nation or economy? Sometimes these things are said to "take on lives of their own." How about the house remodling project you might be working on? These are often said to "take on lives of their own." Where does one draw the line in calling something intelligent? Does a line have to be drawn? Then there is the entire universe. Maybe it's intelligent. Evolutionary theories and intelligence need not conflict. This doesn't really answer the question about what should be taught in biology classes. It's just my thinking that what is currently taught, in it's mechanical workings, can also be intelligent. Possibly it's more intelligent than so called "intelligent design" curriculum; what ever that is. I admit that I just took biology 101, but I was amazed at how the molecules in a cell just happen to be in the right places at the right times for the cell to work. It's truly amazing how this all fits together. No one had to mention a God for me to get the feeling of awe. That doesn't mean I don't believe in something people could call a God. It's just that my biology class didn't have to mention it for me to be awestruck by the intelligence and the intricacy of it all. Similar to seeing a rainbow. I didn't have to learn about that beauty in a Sunday school room. Not that I didn't learn some valuable things in Sunday school rooms as well. The whole picture seems intelligent, to me, but at the same time it seems to work like some machine. Maybe the reality of this question can even be influenced by the observer's "frame of reference." Look at the rainbow from one angle and it's a rainbow. Change angles and it disappears into mere water droplets. Reality, influenced by the observer. A difficult concept for most of our rigid minds to fathom. This is talked about some, in relativity theory, but I am not going to pretend to be an expert on that. Unlike what fundamentalists teach, understanding of truth can be flexible . 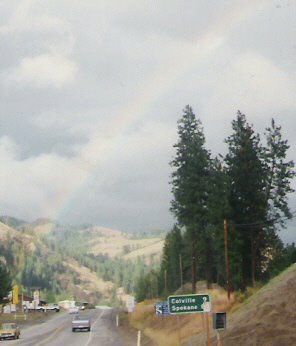 By the way, photo is a rainbow taken in 1995 on my bike trip through Colville, WA. Maybe not the most spectacular, but it was handy. I don't doubt that there is a deliberacy to nature and a complexity, and that its origins are hard to explain. I don;t have a problem with teaching one;s child what we beleive to be true about these processes. But the debate about intelligent design is about whther the public school system should TEACH it as part of curriculum in a nation where religion and state are separate. Inherent to the ID argument is that there is a 'creator" that made all of this complexity that we cannot explain. teaching this is not very different than creationism. I think we can agree that evolution can also be viewed as intelligent design. On matters of religion, we can agree to ;live and let live'. The trouble comes when folks try to impose one spiritual view upon another and have the taxpayers support it. teach religion in Sunday school, science in the classroom. Thats my opinion.